I like to play with a bonus so I’ve signed up to just about every casino on the internet which doesn’t have obviously predatory terms. I always quickly scan through the promotions page and check for feedback on Casinomeister before making a deposit; this technique has held me in good stead so far. 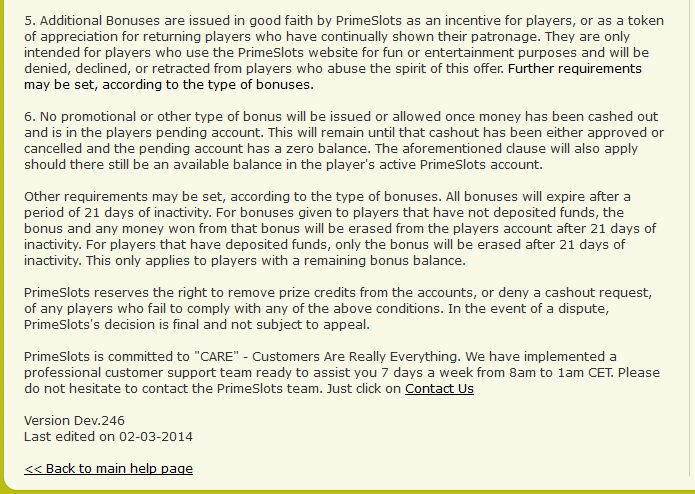 There wasn’t much mention of Prime Slots on Casinomeister (Prime Gaming are in the “Not Recommended” section, but I didn’t think it was the same operation), but they did have good reviews on another gambling website which I found. I deposited £60 at 35xB WR. The 100% match bonus wasn’t added so I opened live chat and they upsold me a better bonus deal (150%) if I deposited another £10. I did, and ended up with a cash balance of £70 and bonus of £105, for a total balance of £175. I confirmed with the chat operator that the standard 35xB WR would still apply. However, they did not have any method to track the progress of the WR in the user account, which I thought strange. Instead I kept a note of how much I had wagered and gambled only in blocks of 100 to keep the maths easy. I played for the whole day, building my balance up to £350 before a bad run of luck just before the wagering was complete brought my balance just under £200. Happy days, time to withdraw, right? But when I went to the cashier to withdraw it told me that I still had over £1,800 to play through. It was after chat hours so I went to bed, angry and confused, and contacted the live chat in the morning. The first line they spun me was that I also had to complete wagering on the £5 NDB that they gave me before I deposited (a balance which I cleared before depositing). Okay, fair enough, that’s another £175 on to the WR but it didn’t explain the massive gulf between my figures and the £1,800 the cashout screen thought I still had to play. The CSR started banging on about only bets over $1 contributing to the wagering and different games having a different weighting, none of which were mentioned on the bonus policy page. When I re-visited the page I noticed a text link hidden amongst the text, in the same colour and without an underline (note: other links on the page are underlined). This links to a page that isn’t linked from anywhere else, which shows all of the predatory bonus terms. The main one being that NetEnt slots only contribute 50% towards the wagering, which stacks up with the discrepancy between my calculations and the casino’s. If you look closely above at paragraph 5., the last sentence states “Further requirements may be set, according to the type of bonuses.” Fine and dandy. It does not appear to be hyperlinked – but it is. It was hyperlinked to “further requirements”: bonus terms that the player would have hardly accepted if he had seen them. The other hyperlinked text on the page resemble normal links (“Contact Us”‘ “Back to main help page.”). They appear as one would expect: links. There would be no room to suspect that there were additional links on the page. It looked pretty normal. When this complaint first appeared, we initially thought that perhaps the HTML was hinky – that an error had been made on the casino’s part. When the casino was notified, they fixed it pretty quickly. It now looks like a normal text link. The player submitted a PAB, and we figured that there wasn’t much we could do – that it was a careless mistake on the casino’s part. Please note the CSS script “Text-decoration: none”. CSS stands for Cascading Style Sheets where coders can define styles for text size, page widths, background images, colors, virtually everything you see on a web page. For this one link, the HTML coders assigned a style that would cause this link to remain invisible. This link was deliberately given an attribute to keep it from being underlined, or change color when one would mouse over it. The other text links on this page – “contact us”, and “back to main help page” functioned normally by default since they had no additional CSS. The only way to tell if this “Further requirements…” text was hyperlinked was to mouse over the text and notice that your mouse pointer turned into a little pointy hand. Anyone properly scrolling down the page would never have noticed this. Why would a casino do such a thing? We can only make assumptions, but it’s pretty clear that this was deliberate. Anyone coding a page would use this CSS script to hide a link – making it appear like the rest of text on the page – thus hidden. Thus – welcome to the rogues.